This is an article from UM Communications which was featured on the UMC website about the Bikes and Bibles ministry. The original article can be read by clicking here. Photo by Judith Osongo Yanga, UMNS. 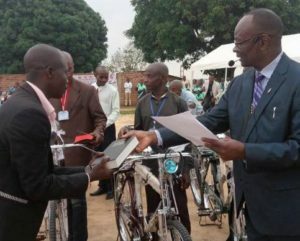 Bishop Gabriel Yemba Unda (right) gives a Bible to a United Methodist pastor in Kindu, Congo, as part of the church’s Bikes and Bibles ministry to help pastors make disciples in inaccessible areas. 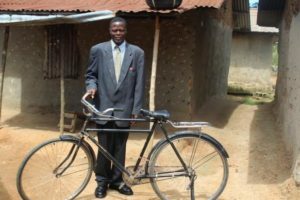 This is an article from UM Communications which was featured on the UMC website about the Bikes and Bibles ministry as it was applied in 2015 in Sierra Leone, a West African country and Annual Conference. The original article can be read by clicking here. A motorbike means more to an evangelist in rural Sierra Leone than a way to get from one place to another.For Hindowa Simbo, a United Methodist circuit minister in the remote Mondema Circuit of the Kenema District in eastern Sierra Leone, a motorbike means a revitalized ministry, easier and faster communication with local churches, savings of money and time and more frequent connections with his congregations. The Mondema Circuit is a hilly terrain with bad roads, some impassable for cars or vans. So Simbo’s ministry got a big boost at the Sierra Leone Conference meeting in Bo, when he received one of three brand new motorbikes through a project called Bikes & Biblescoordinated by Joe Kilpatrick of the North Georgia Conference. Fifteen evangelists from remote communities where transportation is a challenge received three motorbikes, 10 new bicycles and 30 Bibles.